Let us welcome the festival of colors, fun, food, frolic, joy and love with open arms! Every year the festival of Holi marks the end of cold winters and welcomes the fresh breeze of spring season. Now that Holi is just around the corner, what better way to start the celebrations with delicious ghujiyas? Being the food fanatics we are, our idea of a perfect Holi comprises of gujiyas – lots and lots of them. After all, there is something about biting into these sweet flaky snacks that adds to the actual celebrations along with a variety of colors, music and dance. Gujiya, a traditional Holi sweet, loves prepared in millions of households across Delhi, Uttar Pradesh, Bihar, Rajasthan, Madhya Pradesh and now even in other parts of the country. It is more popular sweet in North India, but this uncommon sweet dumpling is not an uncommon sweet anymore. People relish it and love it with all their hearts! CRUNCHY OUTSIDE, SOFT INSIDE – THAT’S WHAT MAKE GHUJJIYAS SHINE! If there’s one traditional sweet treat that’s served during Holi, it’s gujiya. Every halwai and homemaker across North India makes tons of this crispy, golden-brown, stuffed sweet dish to celebrate the festival of colors. The packaging of gujiyas might look a little like samosas, but that’s where the similarities stop. Gujiyas are made with a flour or semolina shell, with a sweet stuffing of khoya and dry fruits such as almonds and cashew nuts. Once the shells are stuffed and shaped, they are deep fried in oil or ghee. Packed with traditional Indian flavours, gujiyas are perfect for every Holi feast–or even a small party. And if that’s exactly what you have planned for this Holi and don’t have enough time to prepare it at home, order it online through Merataskk Delivery service. Every festival or occasion is incomplete without sweets. Gifting sweets has always been the benchmark of Indian tradition, especially during festivals. 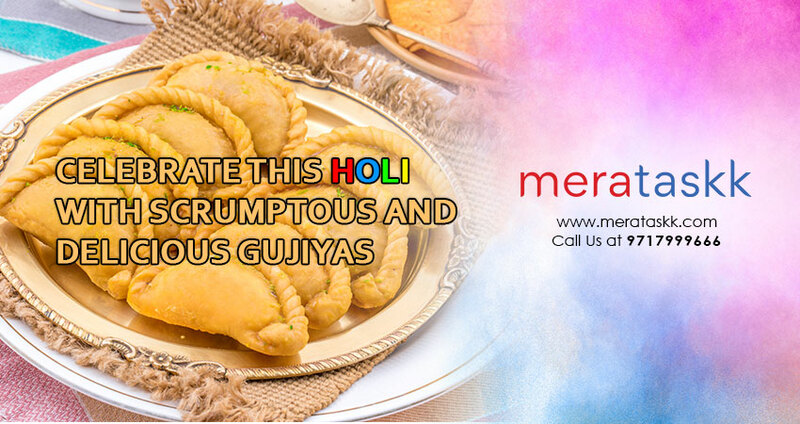 Therefore, this Holi, gift your loved ones with sweets and savouries like gujiyas anywhere across Delhi NCR throughout Merataskk same day delivery services. We have a special gujiya delivery service throughout the Holi season so that no one compromises on this delicious sweet! So, what are you waiting for? Enter the pickup and the delivery address, and get your favorite gujiya delivered to you in no time. Hunger pangs during Navratras? Get your food items delivered through Merataskk. Gear up for the start of the new academic year 2019! DIVE DEEPER INTO THE MEANING OF A “GREAT DREAM” THIS INTERNATIONAL HAPPINESS DAY! Please use the contact form if you have any questions or requests, concerning our services. We provide same day pickup & delivery services. Click on Link below to know more about our delivery services. 2016-2017 www.meratask.com | All Rights Reserved Powered by Medics WordPress Theme.